Objective To investigate the safety and efficacy of mechanical thrombectomy plus rescue therapy for intracranial large artery occlusion (ILAO) with underlying intracranial atherosclerosis (ICAS). Methods Patients enrolled in the intervention group of EAST (Endovascular Therapy for Acute ischemic Stroke Trial) were analyzed. 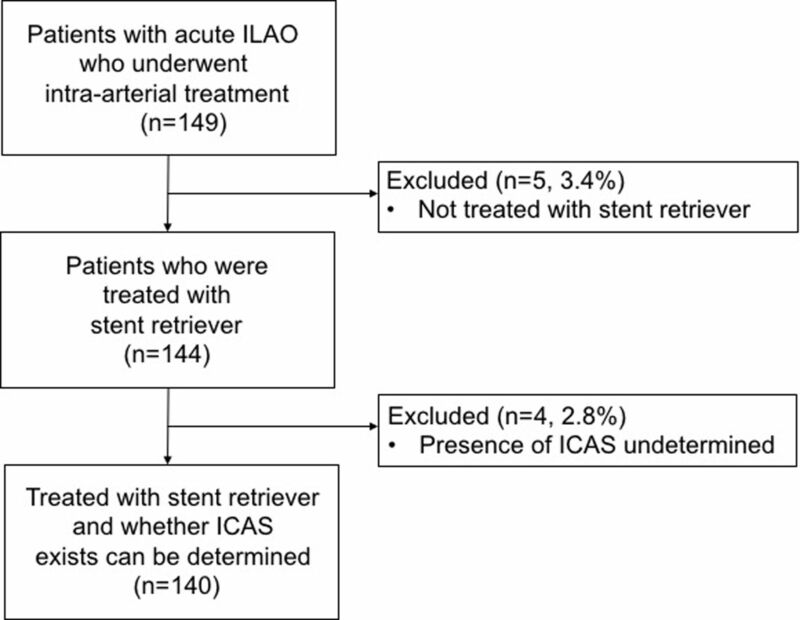 For underlying ICAS identified during the stent retrieval procedure, rescue treatment was required for those with (1) a degree of arterial stenosis >70% or (2) any degree of arterial with blood flow impairment or (3) evidence of re-occlusion. Outcomes were compared between the ICAS group and the embolic group. Multivariate logistic regression was performed to determine independent predictors of functional independence at 90 days. Results Among the 140 patients included in the analysis, underlying ICAS was identified in 47 (34%), and 30 patients (21.4%) were considered to be eligible to receive rescue treatment. Of the 30 patients, 27 (90%) actually received rescue therapy. Recanalization rate (95.7% vs 96.8%, P=0.757) and functional independence at 90 days (63.8% vs 51.6%, P=0.169) were comparable between the ICAS group and the embolic group. No significant difference in symptomatic hemorrhage (4.3% vs 4.3%, P=1.000) or death (12.8% vs 12.9%, P=0.982) was found between the two groups. National Institutes of Health Stroke Scale score at presentation (OR=0.865, 95% CI 0.795 to 0.941; P=0.001) and modified Thrombolysis in Cerebral Infarction after the procedure (OR=2.864, 95% CI 1.018 to 8.061; P=0.046) were independently associated with functional independence at 90 days. Conclusions Mechanical thrombectomy is safe in patients with ILAO with underlying ICAS. By employing a standard rescue therapy, favorable outcomes could be achieved in such patients. Clinical trial registration NCT02350283 (Post-results). Angioplasty and/or stenting have been considered as a rescue treatment for lesions refractory to thrombolysis or thrombectomy.12–14 Recently, several case series reported that it might be safe and feasible to perform such rescue treatment after thrombectomy in patients with underlying ICAS.8 15–17 Nonetheless, these studies were limited by their retrospective nature and the lack of uniformity in the rescue treatment strategy. The aim of this study was to provide prospective data on a strategy of rescue therapy in patients with ILAO with underlying ICAS who undergo mechanical thrombectomy. The information was derived from the intervention arm of the Endovascular therapy for Acute ischemic Stroke Trial (EAST). We compared the safety and efficacy of mechanical thrombectomy plus rescue therapy in patients with underlying ICAS at target lesion with those of patients with embolic strokes. EAST was a multicenter prospective non-randomized controlled trial involving 17 stroke centers in China to evaluate the use of the Solitaire stent in patients with moderate-to-severe stroke. The inclusion criteria were: age >18 years; ischemic stroke with symptoms lasting for at least 30 min without significant improvement before treatment; pre-stroke modified Rankin Scale (mRS) score ≤1; baseline National Institutes of Health Stroke Scale (NIHSS) score ≥8 and <30; baseline Alberta Stroke Programme Early CT Score (ASPECTS) ≥7; occlusion confirmed by imaging at one of the following sites: the intracranial internal carotid artery, first segment (M1) or second segment (M2) of the middle cerebral artery; and able to undergo initiation of endovascular treatment within 12 hours after symptom onset. All patients who qualified for the study were offered endovascular therapy. Those who accepted the treatment were enrolled in the intervention group and those who refused were included in the medical therapy group. Details of the protocol have been published previously.18 In this analysis, we included only patients in the intervention group who underwent stent retrieval. Details of the EAST study are given on clinicaltrials.gov. The protocol of the study was approved by the ethics committee of the leading center and all participating centers. Written informed consent was obtained from all participants or their representatives before enrollment. Patients in the intervention group were treated with mechanical thrombectomy using the Solitaire AB device off label, as the Solitaire FR device had not been approved for marketing in our country at the time. When diagnostic angiography revealed arterial occlusion, thrombectomy with a Solitaire stent was performed as the primary treatment. Local anesthesia was preferred for the procedure. If the patient was too agitated for safe completion of the procedure under conscious sedation, or conscious sedation was considered too risky for the patient’s medical conditions, general anesthesia was induced. During the retrieval process, manual aspiration through a hemostatic valve, long sheath, or the guiding catheter was recommended. Repeated thrombectomy was allowed up to five times if the result was not satisfactory to the operator. Successful recanalization was defined as modified Thrombolysis in Cerebral Infarction (mTICI) 2b or 3.19 The stent retrieval procedure was considered a failure if successful recanalization could not be achieved with a maximum of five passes of the device. Patients undergoing angioplasty and/or stenting received a loading dose of clopidogrel (300 mg) orally or via nasogastric tube immediately after the procedure. Intraoperative bridging with intravenous IIb/IIIa inhibitor was allowed at the operator’s discretion. Patients received dual antiplatelet treatment for at least 3 months before switching to aspirin or clopidogrel alone. Demographic data, clinical manifestations, and procedural details were recorded on the case report forms. All patients underwent non-enhanced CT scans immediately after, and 24 hours after, the procedure to detect whether intracranial hemorrhage had occurred. When the patient’s neurological status deteriorated, a CT scan was immediately obtained. The imaging review to determine whether ICAS exists was done after the study ended in a core laboratory. Two experienced neurointerventionalists who were blinded to all clinical data reviewed the angiograms of all the patients to determine whether underlying ICAS existed. When a fixed focal stenosis was observed at the occlusion site after a retrieval, ICAS was diagnosed. Whether the stenosis met the criteria of rescue treatment was also determined during the review. If no stenosis was observed and the lumen was smooth, the occlusion was considered to be caused by embolism (figure 1). Patients were assigned to the ICAS group or the embolic group based on the imaging review. Case examples of the ICAS group and the embolism group. In case 1, the right middle cerebral artery (MCA) was occluded in the M1 segment (A), and a severe stenosis appeared after the stent retrieval procedure (B, C). Case 1 was assigned to the ICAS group. In case 2, the occlusion was in M1 segment of the left MCA (D), and the lumen was smooth with no stenosis after stent retriever (E, F). Case 2 was assigned to the embolic group. ICAS, intracranial atherosclerosis. Demographics, risk factors, clinical and procedural characteristics, and outcomes were compared between the ICAS group and the embolic group. The Mann–Whitney U test, χ2 test, and Fisher exact test were used for comparison. Independent associations of clinical outcome at 90 days (mRS score ≤2) with clinical, radiological, and procedural factors were determined with a multivariate logistic regression analysis. The variables tested in the logistic regression model were those with a value of P<0.1 in the univariate analysis. A value of P<0.05 was considered significant. Among the 149 patients enrolled in the intervention group, nine were excluded from the analysis: five for protocol violation because the Solitaire stent was not used, and four where it was not possible to determine whether underlying ICAS existed (figure 2). Patient inclusion flow chart. ICAS, intracranial atherosclerosis; ILAO, intracranial large artery occlusion. 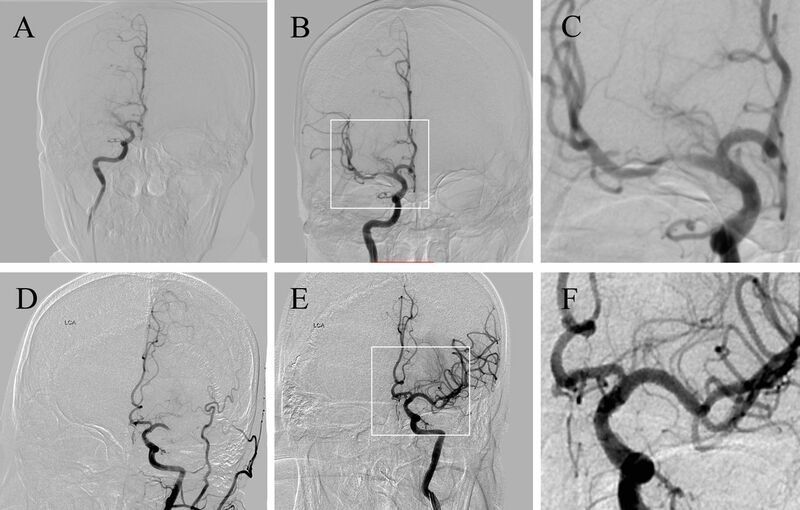 Of the 140 patients included in the analysis, underlying ICAS was identified in 47 (34%), with 28 (59.6%) in the M1 segment of the middle cerebral artery, 15 (31.9%) in the terminal internal carotid artery, and 4 (8.5%) in the M2 segment. Among the 47 lesions in the ICAS group, 30 met the criteria for rescue treatment during the imaging review, of whom 27 (90.0%) actually received rescue treatment in the procedure. The rescue treatment was stent-retriever detachment alone in 2 (7.4%), balloon angioplasty alone in 7 (25.9%), using other stents alone in 8 (29.6%), and angioplasty plus stenting in 10 (37.0%), including detaching Solitaire stents in 9 (33.3%) and using other stents in 1 (3.7%). Balloons used for rescue treatment were the Gateway balloon (Boston Scientific) in 14 patients and Maverick (Boston Scientific) in three patients. Stents other than the stent retriever were Apollo (Microport) stents in eight patients and a Wingspan stent in one patient. For the three patients who met the criteria and did not receive rescue therapy, the stenosis was considered to be <70% with good distal flow during the procedure. None of the 17 patients who did not meet the criteria received rescue treatment in the procedure. The Solitaire stents were also detached in two of the 93 patients in the embolic group. Patients in the ICAS group were younger (60 vs 66, P=0.014) and a larger proportion were male (74.5% vs 54.8%, P=0.024) than those in the embolic group. Atrial fibrillation was more prevalent in the embolic group than in the ICAS group (49.5% vs 25.5%, P=0.007). The ICAS group had a lower baseline median NIHSS score than the embolic group (14 vs 17, P=0.022). No significant difference was observed in other risk factors and the occlusion site between the two groups. A trend for general anesthesia to be used more frequently was seen in the ICAS group (P=0.077). About half of the patients in the ICAS group received a glycoprotein IIb/IIIa inhibitor, and about 18.3% in the embolic group (P<0.001). The procedure time (puncture-to-recanalization) of the ICAS group was significantly longer than that of the embolic group (68 vs 51, P=0.020) (table 1). Successful recanalization was achieved in 135 patients (96.4%) overall, and 78 patients (55.7%) had functional independence at 90 days. Among the five patients with unsuccessful recanalization, four (80%) had an mRS score of >3 at 90 days. Two of the three patients with ICAS who met the criteria but did not receive rescue therapy died and the other patient had an mRS of 3 at 90 days. In the ICAS group, 34 patients (72.3%) achieved an mTICI of 2b or 3 before rescue therapy and the recanalization rate was improved to 95.7% at the end of the procedure, which was similar to the embolic group (96.8%, P=0.757). The proportion of functional independence at 90 days was slightly higher in the ICAS group than in the embolic group, but the difference was not significant (63.8% vs 51.6%, P=0.169). ICH was more frequently detected on non-contrast CT in the embolic group (29.0% vs 10.6%, P=0.014). There was no significant difference in symptomatic ICH (4.3% vs 4.3%, P=1.000) or death (12.8% vs 12.9%, P=0.982) between the two groups. (table 2). Comparison of the results with previous studies is summarized in online supplementary table 1. Multivariate logistic regression analysis showed that the NIHSS score at presentation (OR=0.865, 95% CI 0.795 to 0.941; P=0.001) and mTICI after the procedure (OR=2.864, 95% CI 1.018 to 8.061; P=0.046) were independently associated with functional independence at 90 days. We described a cohort of patients with acute ILAO in the anterior circulation who underwent endovascular treatment and compare outcomes between patients with and without underlying ICAS. By employing a standard protocol for the application of a rescue treatment strategy, comparable clinical outcomes may be achieved in patients with underlying ICAS and in the embolic group. Underlying ICAS was identified in about one-third of the patients in this cohort, which was higher than in previous reports in Asia.15–17 A possible explanation might be that we used different definitions of ICAS in this cohort from those used in other studies. Yoon et al 15 and Al Kasab et al 17 defined ICAS as severe (>70%) or ‘significant’ fixed focal stenosis at the occlusion site. Kim et al 8 and Lee et al 16 defined ICAS as (1) a degree of fixed stenosis >70% or (2) moderate fixed stenosis with either flow impairment or with re-occlusion tendency. In this study, we defined fixed focal stenosis after retrieval as underlying ICAS regardless of the degree of stenosis and flow status, which led to the higher rate of underlying ICAS than in previous reports. When the criteria: (1) degree of stenosis >70% or (2) any degree with distal blood flow impairment or (3) evidence of or repeat re-occlusion were used, the incidence was similar to that found in previous reports. The rescue therapy strategy was to detach the stent retriever or to perform balloon expansion or stenting in a patient who met certain criteria. The specific rescue technique was determined by the operators during the procedure based on characteristics of the lesion and access, aiming for good recanalization. The recanalization rate and functional outcome at 90 days were similar in the ICAS group and the embolic group in this study. Previous reports yielded different results for recanalization rate and clinical outcomes between the two groups.8 15 17 Kim et al reported similar recanalization rates and poorer clinical outcomes in patients with ICAS. Al Kasab et al showed a significantly lower recanalization rate and a trend towards poorer clinical outcome in the ICAS group compared with the non-ICAS group. However, Yoon et al reported a higher recanalization rate and more favorable outcomes in patients with ICAS than in those without ICAS. Possible reasons might include the retrospective nature of the studies, different definitions of ICAS, different endovascular treatment strategy, and ethnic difference. The procedure time in the ICAS group was longer than that for the embolic group. It is noticeable that the median procedure time in the ICAS group was only 68 min, which was shorter than found in previous reports.8 17 The preset rescue protocol in this prospective study might have facilitated decision-making by the operators, thus shortening the procedure time. One major concern about the intracranial angioplasty and/or stenting was the increased risk of hemorrhage due to the use of antiplatelet medication. In this study, there was no significant difference in symptomatic hemorrhage or death between the two groups, which was consistent with previous studies.8 15 In addition, ICH detected on CT was lower in the ICAS group than in the embolic group. Possible reasons might be that during the progression of ICAS, good collaterals were developed which sustained the blood supply of the occlusion artery walls and reduced the risk of blood leakage, which has been reported previously. Therefore, the safety of the strategy should not be a problem. The independent predictors for functional independence at 90 days were baseline NIHSS and mTICI after the procedure. Baseline NIHSS was significantly lower in the ICAS group, possibly because of the ischemic preconditioning and better collaterals. The difference probably contributed to the 12.2% greater functional independence in the ICAS group than in the embolic group. Successful recanalization has been reported to be an independent predictor for clinical outcomes in patients with ILAO caused by embolism.22 Our results suggested that for patients with underlying ICAS, better recanalization was also associated with better clinical outcomes. This study has several limitations. First, the diagnosis of underlying ICAS after thrombectomy mainly depended on the imaging characteristics of the local lesion during the procedure. It is difficult to determine whether ICAS exists in some patients, as in this study. In addition, there is discrepancy between core laboratory interpretation and interventionalists' interpretation of the rescue criteria in the procedure. Recently, Jin Soo Lee et al suggested standard steps for the angiographic diagnosis of ICAS.23 A more specific and uniform definition of underlying ICAS for endovascular treatment, considering stroke mechanisms, is needed in future studies. Second, the rate of use of IV tissue plasminogen activator was low in the cohort because some patients with an extensive thrombus burden underwent endovascular treatment directly. Interpretation of our results should take this into consideration. Third, we did not evaluate the collateral status in this analysis. The association between collaterals and the presence of ICAS, as well as the outcomes, should be investigated in future studies. Fourth, this study was performed in China, where the prevalence of ICAS is higher than in other parts of the world. In addition, the results of intracranial stenting reported from China are consistently better than those reported from other parts of the world and in other trials. Therefore, the generalizability of the results may be limited. Finally, the sample size was not sufficiently large, which might have led to false-negative results. Future large prospective controlled trials are needed to confirm the efficacy of the strategy. Mechanical thrombectomy in conjunction with a standard rescue therapy could achieve recanalization rates and outcomes in patients with ILAO with underlying ICAS comparable to those attained in patients with embolic strokes. We thank Ya Peng, Yibin Cao, Shengli Chen, Meng Zhang, Changchun Jiang, Xiaoxiang Peng, CunfengSong, Liping Wei, Qiyi Zhu, Zaiyu Guo, Li Liu, Hang Lin, Hua Yang, Wei Wu, Hui Liang, Anding Xu, and Kangning Chen who carried out patient enrollment and data collection.
. Angioplasty of intracranial occlusion resistant to thrombolysis in acute ischemic stroke. Neurosurgery 2001;48:1282–8.
. A standardized method for measuring intracranial arterial stenosis. AJNR Am J Neuroradiol 2000;21:643–6. Contributors BJ: analysis and interpretation of data, drafting the manuscript. LF, XH: analysis and interpretation of data, critical revision of manuscript for intellectual content. DL, YiW: study concept and design, critical revision of manuscript for intellectual content. FG, NM, DM: acquisition, analysis, and interpretation of data. NM, LL,XL:acquisition of data, analysis and interpretation of data. CW, XZ, YoW: study concept and design, study supervision. YP, HL: analysis and interpretation of data, study supervision. Z-RM: study supervision,study concept and design, critical revision of manuscript for intellectual content. Funding This work was supported by National Science and Technology Major Project of China grant numbers 2011BAI08B02, 2015BAI12B04, and 2015BAI12B02. Ethics approval Ethics committee of Beijing Tiantan Hospital.